The summer holidays are dragging on and Harry Potter can't wait for the start of the school year. There are spells to be learnt, potions to be brewed and Divination lessons (sigh) to be attended. Harry is expecting these: however, other quite unexpected events are already on the march. 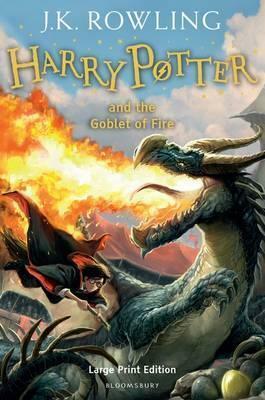 All Harry Potter titles are now available in large print. 'The world of Hogwarts is complete in every way the richness and scale of Rowling's invention is exhilerating.' - "The Guardian". Harry Potter and the Philosopher's Stone was J.K. Rowling's first novel, followed by Harry Potter and the Chamber of Secrets, Harry Potter and the Prisoner of Azkaban, Harry Potter and the Goblet of Fire, Harry Potter and the Order of the Phoenix, Harry Potter and the Half-Blood Prince and Harry Potter and the Deathly Hallows, as well as three books written for charity and inspired by the Harry Potter novels: Fantastic Beasts and Where to Find Them, Quidditch Through the Ages and The Tales of Beedle the Bard. The Harry Potter novels have now sold over 400 million copies worldwide and been translated into 70 languages. J.K. Rowling has generated huge popular appeal for her books across the generations in an unprecedented fashion: she was the first children's author to be voted the BA Author of the Year, and also to win the British Book Awards Author of the Year. J.K. Rowling lives with her family in Edinburgh.